When the umbral kobold owner of the Exploding Herb alchemy shop is questioned about a magical gem that he may or may not have enchanted, both danger and bombs fly. Will Kurdag find a mortal enemy among the Hookblades? Will the neighbor's wagon be smashed to splinters or explode into woodchips? 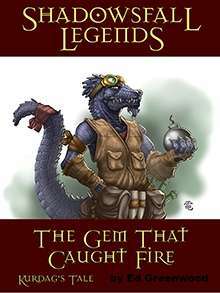 The Gem That Caught Fire is the second in the Shadowsfall Legends line of short tales taking place on the Plane of Shadows. Now available in PDF, ePub, and mobi (Kindle) formats. This title was added to our catalog on March 02, 2012.